عندما تزور داروين, ستشعر أنك في بيتك في Palms City Resort الذي يقدم لك إقامة متميزة و خدمات عظيمة. يحظى هذا الفندق ذو 3.5 نجمات بمكان ممتاز يسمح بالوصول إلى المعالم السياحية الأكبر في المدينة، فهو يبعد مسافة 0.4 Km عن صخب المدينة. سوف يعشق النزلاء موقع هذا الفندق، فهو قريب من أهم المعالم السياحية في المدينة كمثل ‪Darwin Cenotaph‬, Aboriginal Bush Traders, البرلمان . إن الخدمات التي يقدمها Palms City Resort تضمن للنزلاء إقامة مريحة. يمكن للنزلاء الاستمتاع بالميزات التالية: واي فاي مجاني في جميع الغرف, أمن على مدار 24 ساعة, خدمة التنظيف يوميًا, خدمة غسيل ذاتية, خدمات بريدية أثناء إقامتهم في هذا المكان الرائع. في Palms City Resort غرف نوم يزيد عددها عن 89 صممت بذوق وعناية لتوفر لك كل وسائل الراحة . بعضها يحتوي أضاً على تلفزيون بشاشة مسطحة, حوض الاسترخاء, غرف لغير المدخنين, مكيف هواء, خدمة الإيقاظ. يقدم الفندق مجموعة واسعة من وسائل الراحة المتنوعة، كمثل: حمام سباحة خارجي, سبا, حديقة. إن Palms City Resort هو خيارك لخدمة الفنادق الراقية في داروين. The location was ok, close proximity to the city center where all hive of activities are centrally located. The bus station is within walking distance from hotel. Walking access to nearby places of interests such as Darwin wharves and the tunnel. Location offers great walking tours surrounding . A quiet resort tucked at a corner with great value for money stay. I am from Melbourne and currently living and working in Darwin for 6 months and stayed at Palms City for two nights just to treat myself after returning from a visit home. I loved my stay at this resort and will definitely be coming back soon. My room was clean and had everything I needed, the staff were lovely and helpful and the pool was great. Would definitely recommend to my friends and family back in Melbourne as the place to stay if they decide to visit Darwin. Palm City is a good hotel, the cleaniness was excellent and the replacement of toiletries was perfect. Staff on arrival were ok but not as friendly as I would have expected. Complimentary car parking which was great as well. The only problem I could see was there was not wear to hang wet swimmers or towels. I would ask for an up stairs room next time. Palm City Resort has to be close to the best place to stay in Darwin, not because it is swanky with grand rooms and luxurious appointments but because the staff are fantastic, the rooms are a nice size, clean, well organized and those upstairs have nice verandas. The resort location is superb, located near the western end of Mitchell St and on the esplanade (near Parliament House) it has beautiful tropical gardens and as such is the perfect oasis to relax after a trek to the outback or even a nice meal at one of the many restaurants or great pubs co-located close by. Highly Recommend will definitely stay again. Loved the location and the gardens . Didn't try the cafe this trip . We loved having a barbie on the porch. The guest freezer in the laundry was a bit neglected. It would have been useful to have a key for the back gate. LOVED the pool . Palms City Resort..... A peaceful place right by the sea in Darwin, well equiped bungalow set in palms and a nice pool area. Equiped with micro, fridge and bbq which they clean daly for you! All the guys working here, well done you were top notch. A great place for exporing Darwin from or to stay after a trip on the NT. We enjoyed our recent stay at Palms City Resort and absolutely loved Darwin. Staff was great and professional and the rooms were very clean. Bathrooms in particular were nice and we really enjoyed the pool. The only drawback was that we had a room that was a bit too close to the hotel entrance and picked up street noise from Esplanade. To their credit the staff offered to move us to a different room when one became available but we had several all-day tours and decided to stay where we were. Very helpful and friendly staff, spotless and comfortable rooms, a very convenient location. We stayed in a garden bungalow before going off on a week’s nature tour, then came back for one night in a standard room (very nice and quiet). Would happily stay here again or recommend to others. The staff at the Palms City Resort are very helpful and caring, we stayed two nights and were appreciative of the service and cleanliness of the resort. The location was perfect for being in Darwin City. We've stayed at Palms City Resort on previous occasions and have found it to be a very relaxing experience even in its location in Darwin's CBD. The resort is planted out with tropical plants and any external noise is muffled as a result. The staff are very professional, helpful and efficient while the resort has all the facilities required for a very pleasant stay. There are numerous restaurants nearby along with department stores and supermarkets. Breakfast is available and very good while al fresco breakfasts are available in nearly Smith St Mall. Palms City Resort is highly recommended for getting away from it all and relaxing while in the middle of the city. Our stay was an overnight stay, waiting for a flight home. Arrived early from an overseas flight, room wasnt ready, upgraded to a bungalow for a nominal price. The bungslows are clean, modern, well equipped, ample tea n coffee, fan n quiet aircond. Kitchen equipped with the basics for BBQ cooking. Bungalows though close to one another are private with balcony n BBQ. Pool is surrounded by tropical garden. Easy walk to deck chair theatre, city, restaurants n waterftont precinct. We did not have the in house breakfast at $23pp. The Palms a great place to stay. Stayed in bungalows along the street. Pros - rooms were clean, staff friendly. Cons - as non Austrailian vacationers, we rely heavily on wifi service to plan activities and keep in contact at home. DO NOT stay in a bungalow along the street unless they seriously improve wwifi service. Signal/connections could not be established in the three differnt rooms we tried. Had to eighther sit outside along the street or stand on the other side of the bungalo in the access drive. Final (4th one) could hold a connection in the room. Staff was accomodationg to let us try several vacent streetside rooms till we found one that would work. Generally a quiet area/street, but be prepaired for some early morning lorry/truck traffic going by your bungalow 10m away. We would stay again BUT, it would have to be in one of the inner ring of bungalows farther from the street and IF they have better wifi.. At that price point wifi should be strong and blazing fast throughout the property. well located facilty within walking distance of most places of interest. 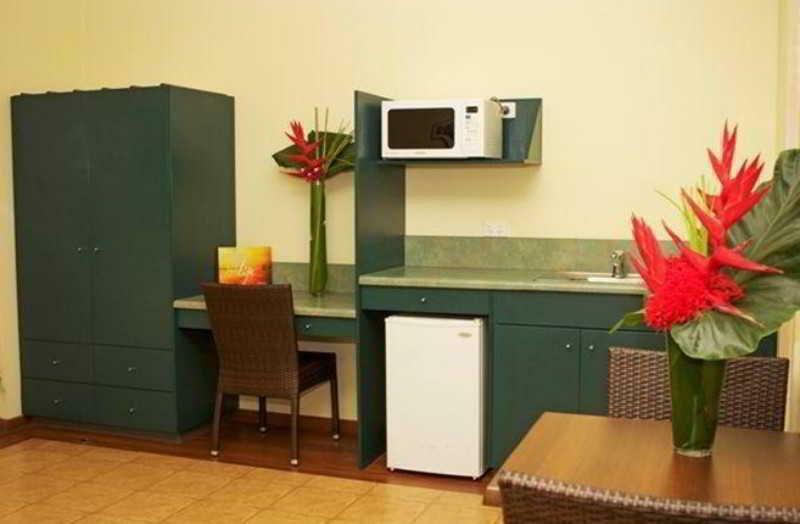 Only a breakfast facility is available or you can make use of the well equiped kitchen in your room. Gardens and facilities are well mintained. We stayed in a double room with bathroom, the room was large with a good airconitioning and a fan. Comfortable bed and sheets changed daily. We had our own balcony overlooking the heated pool. Important for us was the tea making facilities and plenty of tea bags and milk. This hotel is only minutes away from the bus terminal and also the Bay Area, ships and restaurants.